The Superior Key Transfer Interlock, Type B-1088 is a necessary auxiliary device to many Interlock installations. Use of the transfer provides great flexibility of operation of an interlock system and is a powerful tool in interlock logic design. The key transfer interlock is a central exchange point where the final keys of one or more interlock sequences are exchanged for one or more different keys for additional operations or vice versa. Those keys which are normally contained in the key transfer interlock are called "secondary keys" whereas those keys which are required in the key transfer interlock to effect the release of the secondary keys are termed "primary keys." The Superior Key Transfer Interlock, Type B-1088 consists of a primary group of one or more keys and a secondary group of one or more keys, the groups being arranged in opposition to each other on the cover plate. The locks are connected together by a linkage. The entire mechanism is mounted in a cast case. For simplicity in design and smooth operation the smaller quantity of locks will be mounted on the bottom of the transfer block. The linkage mechanism makes it necessary to deposit all of the primary keys before any of the secondary keys can be removed from the interlock or vice versa. The full complement of keys must be deposited in the Interlock before it can be operated. For this reason the removal of a single key will prevent the removal of any of the keys of the opposing group. Standard groupings are available ranging from a minimum of two locks to a maximum of twelve locks. For larger grouping requirements Superior offers our NEMA enclosed Transfer interlocks. Please see the associated cut sheets and information pages or contact our factory for details. 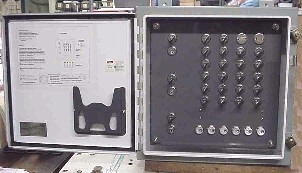 Some accessories available for these units are spare lock provisions for future system expansion, unitized transfers, where more than one transfer is integrated into a single enclosure, padlock hasps, auxiliary contacts, etc. The type B-1088 NEMA Transfer Enclosure was developed over a period of time and is mostly used, but not limited to, Interlock Systems for Electrostatic Precipitators. The large volume of access doors on such equipment brought about the necessity for an enclosure for a large number of locks. For practical reasons, the size and also the total weight have to be considered in order for the enclosure to be handled properly. 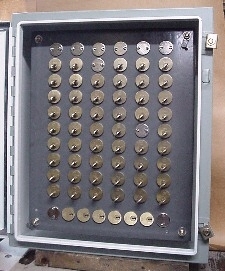 200 locks within one enclosure should be considered the maximum for this purpose. If more locks are required, a second enclosure should be added. It must be sequentially tied to the first enclosure. In effect, these Key Transfer Interlocks are control exchange points, in which the final key of one or more interlock sequences are exchanged for one or more different keys for additional operation or vice-versa. The lock arrangement can be obtained in any configuration regarding primary or secondary keys. These key groups are interlocked within. An internal locking bar is utilized to accomplish this effect. This device makes it impossible to defeat the key release. The linkage mechanism forces the operator to deposit all primary keys before any of the secondary keys can be removed. The full complement of keys must be deposited in the Transfer Interlock before it can be operated. Therefore, the removal of a single key will prevent the removal of any of the keys of the opposing group. The above concept of Transfer Interlocks is widely accepted. 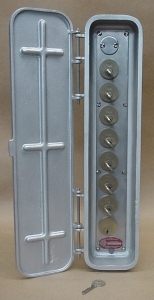 The NEMA Enclosure can house individual lock groups operating independently in sequence but having a common enclosure. Superior will continue to manufacture the smaller type B-1088-2 thru 12 Transfer Enclosures illustrated on the preceding pages. The smaller units can be used in multiple units without limitations to accomplish the same function as the larger NEMA Enclosure. The B-1088 smaller enclosure does have a greater mobility. It is mounted singly or in groups close to the access doors, which does not make it necessary for the operator to carry a full complement of access door keys from one point to all access doors. Variations are almost unlimited for both Transfer Interlocks and can be manufactured to suit your requirements. Some accessories available for these units are spare lock provisions for future system expansion, unitized transfers where more than one transfer is integrated into a single enclosure, stainless steel enclosures (NEMA 4X), viewing windows, drip shields, etc.